Great sounding hand crafted picks made in Nashville, TN! 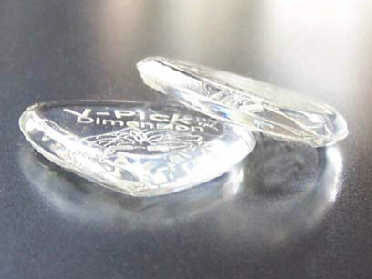 Same as the regular Dimension, only this pick is flame polished and then hand buffed. Has the same feel but it does not have the "whoosh" sound as it's sibling does. A wonderful pick for Blues, Jazz, Rock, Metal and Country. Inspired and dedicated to Michael "Muddy" Lawrence who is a fabulous guitarist. http://www.myspace.com/rottersclub Muddy wanted a pick that sounded like something Beck would use. This pick is the result of this quest. 4.10mm thick and cut out the same size as the SNAKE. 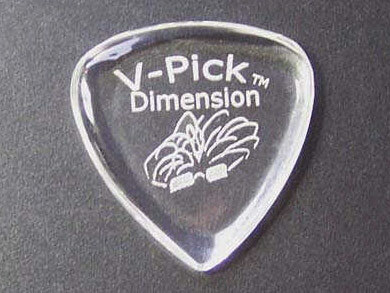 This pick is very comfortable and easy to hold. 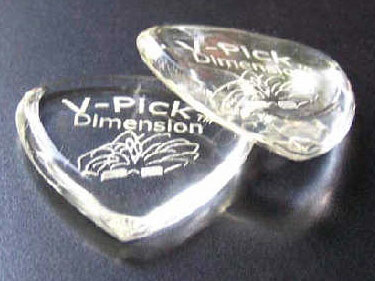 Has the V-Pick "Grippage" that you have heard so much about. You will not drop these picks! When your body head warms them up, they cling to your fingers without being sticky. The Dimension has 2 rounded corners and one pointed corner. The best of both worlds! Just spin this puppy around and you have a Bluesy, warm, smooth attack for that "buttery" sound, and then switch to the pointed end and Voila, exact, precise articulation. Just a great all around pick indeed!